Newark Castle — the Gatehouse, North Tower and part of the River Front. THE CASTLE OF ALEXANDER THE MAGNIFICENT. "HENRY, King of England to all the Barons and to the Sheriffs and to his ministers and faithful men of Nottinghamshire, Greeting. Know ye, that I have granted to Alexander, Bishop of Lincoln, that he may make a ditch and rampart of his fishpond of Niwerc upon the Fosseway and he may divert the Fosseway through the same town as he shall wish." Newark is one of the few places in this country which can quote the words of the actual royal charter which gave to the town its castle. The king in this case was Henry I, fourth son of the Conqueror and third Norman king of England, and it is generally considered that the Newark charter was granted in 1135, the last year of his reign. The grantee was a man of considerable influence in England at the time, Alexander "the Magnificent," Bishop of Lincoln, one of the several illegitimate offspring of the great castle-building Bishop of Sarum, Roger, and usually referred to as the latter's "nephew." Alexander had distinguished himself as a builder by completing the great Norman cathedral commenced by Bishop Remigius on the hill ot Lincoln after the see had been removed from Dorchester in 1073, and no one contemplating the remains of his fine arcaded west front and its twin towers will feel disposed to begrudge the architect his title of "Magnificent." 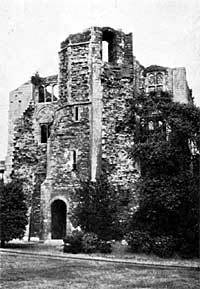 Newark Castle — the Gatehouse from the South East. Let us consider what led this energetic ecclesiastic, his cathedral completed, to turn his hand to castle-building. Henry had been on the throne for thirty-five years and was in his sixty-eighth year. The disaster to the White Ship fifteen years before had robbed him of his heir, and it must have been apparent to all that the King's death would instantly plunge the country into anarchy. The great lay lords were already plentifully supplied with strong castles in which they might keep themselves and their property secure when the troubles should come, and many ot their ecclesiastical contemporaries had also succeeded in providing themselves with fortified places at their chief manors. Alexander had an example before him in his "uncle" Roger of Sarum, who had castles at Sarum, Devizes, Sherborne and Malmesbury, whereas the new see of Lincoln was not yet similarly provided. It must be small blame to Alexander, therefore, that he managed to procure from Henry charters for castle-building at three places in his large diocese, these being Newark, Banbury in Oxfordshire, and Sleaford in Lincolnshire itself. The castle of the period was, of course, of very different structure from the high and many towered stone walls with which we usually associate castles in this country, and which were only the product of centuries of evolution, and, moreover, took many years to build. The only requirement ot the ordinary castle-builder of the early 12th century was a ditch with which his timber hall could be surrounded so as to keep malignant trespassers from burning it while he slept. The earth taken out of this ditch could either be piled against its inner brim to form a rampart, or else spread over the whole area of the castle to form the mound so frequently found as the base of Norman castles in this country. The edge of the mound or the summit of the rampart was usually crowned by a hedge or palisade of squared logs and the entrance through this approached by a timber bridge crossing the ditch before it. 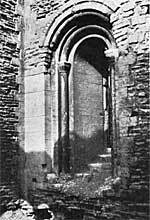 Newark Castle — Chapel window. The phraseology of the foundation charter in this case is unusual. Permission is always granted to dig a ditch, and usually the complement of this is given as the "bretagium" (lit. boarding), the timber palisade above the inner edge of the ditch. In this case, however, the palisade is not mentioned; instead, we have the definite mention of a "calceto" or bank, the rampart which is formed of the soil taken from the ditch if it is not spread over the castle to form the usual Norman mound. This unusual phraseology may be due to the existence of the fishpond out of which Alexander was intending to construct his castle and which rendered difficult the erection of a mound, or, as has been suggested below, there may have been a timber hall already existing, which would have been half-buried if a mound had been raised. The castle at Sleaford, the earthworks of which remain, was somewhat smaller than that at Newark. The plan is a distorted square, or, perhaps more accurately, a regular trapezoid, the longer of the two parallel sides being the water front of the castle, which rises above the River Slea. The area within the castle walls is about 250 ftet in each direction. Subsequent additions have surrounded the original site with an outer bailey, but the plan of the earth and timber castle of Alexander can be easily detected. Banbury Castle has practically entirely disappeared. It stood close to the market place of the town and, although having to undergo a far less stringent siege than its sister castle at Newark, was far more vindictively slighted after the Civil War than the Nottinghamshire fortress. A 17th-century map, however, has fortunately preserved for us the general lines of its plan, and the original castle of Alexander may be seen bordering the marshy shores of the Cherwell in much the same fashion as the other two castles by their respective streams. The enclosure at Banbury was about 200 feet square, and was thus the smallest of the three, as Newark Castle was contained in an area about 250 feet by 180 feet, and was the largest of the three. Banbury Castle was surrounded by a large outer bailey. It will be noted that the plans of the castle of Sleaford and Banbury are approximately square, whereas that of Newark is an oblong. The reason for this is quite easy to see, even if the foundation charter did not give us the clue. Alexander's fishpond lay between the River Trent and the great Roman highway known as the Fosseway, which left only a narrow strip of land between road and river, so that it was necessary, even to produce an oblong castle, to divert the highway in order to get the castle in at all. The site of the pond itself was presumably where the north-east ditch of the castle now runs in front of the great gatehouse, and possibly the manor house of the bishops of Lincoln stood by its side where the castle is now. Perhaps it was the existence of this house which prevented Alexander from raising a mound, and so instead, he merely surrounded it with a rampart made of the soil from the ditch. Whether or not, however, there was a house already existing when Alexander commenced his castle of "Niwerc," it seems probable that he soon rebuilt it, as by 1139, Henry of Huntingdon, describing the adventures of the Bishop, who had been arrested by King Stephen and ordered to give up his castles, says:— "The King took Alexander the Bishop, whom he had put in prison at Oxford, to Newark. The Bishop had built there, upon the river Trent, in a very pleasant spot, a magnificent castle of very ornate construction. When he had arrived there, the King appointed to the Bishop a fast, not according to law, affirming with an oath that he should go without all food until he should surrender the castle to him." We can form very little idea of the appearance of the castle which the unhappy Alexander then surrendered to the incensed king. Its ditches and palisaded ramparts we can visualise to a certain extent, but what was the "very ornate" building which the Bishop had erected within their protecting lines? No timber buildings of the period are left in this country by which we can form an opinion. The only timber structures remaining in this part of Europe which were standing in the early 12th century are the "stave-churches" of Norway, with their lofty, aisled halls, surrounded on all sides with loggias and with their gables ornamented with reproductions of the prows of those dreaded long-ships which had brought the ancestors of the castle-building Normans to their hard-won colony of Normandy. May it be that Alexander's castle hall at Newark resembled in some small degree those ornate structures, with their exquisitely-carved doorways and high-pitched roofs ? Whatever its architectural embellishments, however, it appears to have been strong enough as a castle, so that King Stephen had perforce to use persuasion on its owner as described above to procure its surrender, as Henry of Huntingdon tells us that the garrison were very loth to open its gates. 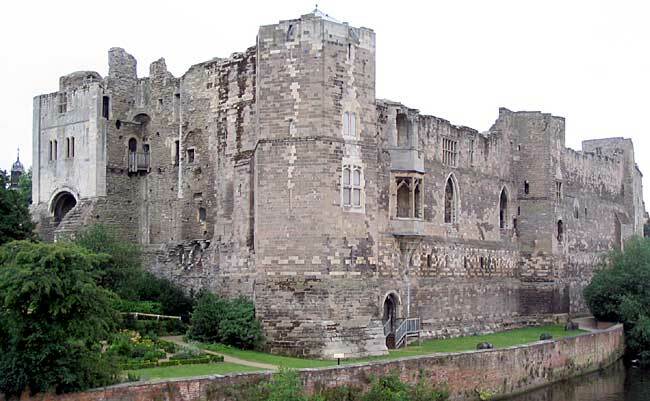 It was probably well manned, as Henry had followed up the foundation charters of the three Lincoln castles with others granting the use of the third parts of the services of the soldiers of the Bishopric of Lincoln to the castles, so that they may perform castleguard and all other services as the Bishop may arrange. "Know ye that I have granted to Alexander, Bishop of Lincoln, that he may cause a bridge to be made over the water of Trent to his castle of Newerc it so be that it will not harm my city of Lincoln nor my borough of Nottingham, and if it would injure them, let him make such a one as will not injure them." Alexander died in 1148, and was succeeded by Robert de Chesney, who held the see for nineteen years, and during his episcopacy built a palace for the bishops at Lincoln. At his death in 1167, the king, Henry II, as was his policy at the time, took the castle into his own hands, retaining it until 1184.